Vincenzo Marrazzo is a Test Automation Specialist. He has 10 years of experience in various context both with open-source technologies and commercial ones. His primary activities are automation testing and performance testing. Vincenzo currently works at Altran Italia. Performance testing specifications usually state how many requests per second (RPS), or throughput, the application should hold to reach eligibility for production. Sometimes, RPS is numerically included in the requirement, e.g: for 1000 HTTP requests per second, the application response time should be less than 200 msec. Or, it can be identified as the goal of a series of tests, e.g: find the RPS that produce a response time of less than 250 ms, for 95% of the messages. In this blog post, we will show how to adjust RPS in Apache JMeter™. First, we will use JMeter’s Constant Throughput Timer element and the command line. Then, we will show how to automate long run executions by splitting the RPS into different time slots through a Shell script. What is the Constant Throughput Timer? 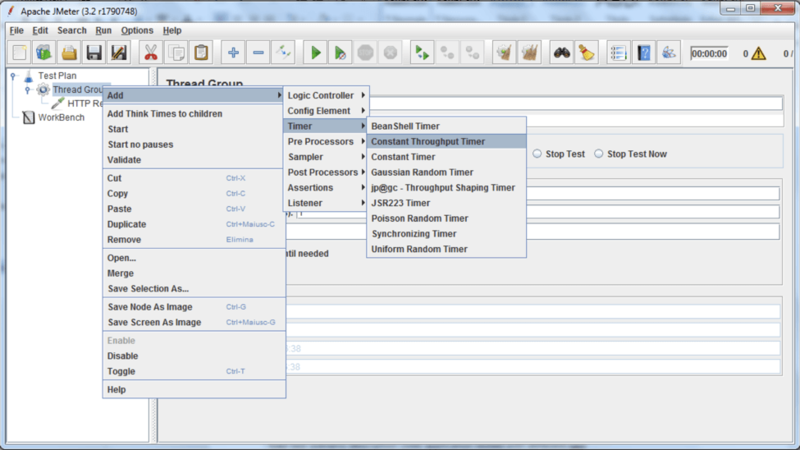 One of the most commonly used timers in JMeter, the Constant Throughput Timer enables you to decide how many samples should be executed per minute. The Constant Throughput Timer will add random pauses between requests during test execution to match the required throughput figure (samples per minute). Let’s create a simple scenario for using the Constant Throughput timer, and then adapt the jmx script to handle the input RPS from the command line. 1. 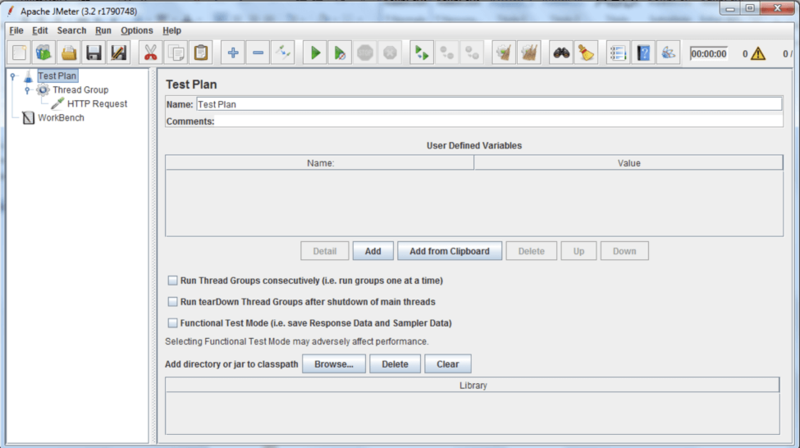 Add a Thread Group and a Sampler to your Test Plan. 2. Now, add the Constant Throughput Timer. “duration_second”, this variable will parametrize the duration of scenario execution. I set the value to 60, but this will be changed via the command line later. “load_msg_sec”, this variable will parametrize the RPS load of the application under test. I set the value to 20, but this will be changed via the command line later. The “__P” function includes the default value to be used if JMeter is missing any command line arguments at launch time. These user defined variables are fetched by command line arguments at launch time and resolved by them. In addition, variable values are constant for all threads during JMeter execution. The “Constant Throughput Timer” requires that the target throughput is described as “sample per minute”. Therefore, it’s necessary to “translate” RPS to “sample per minute”. 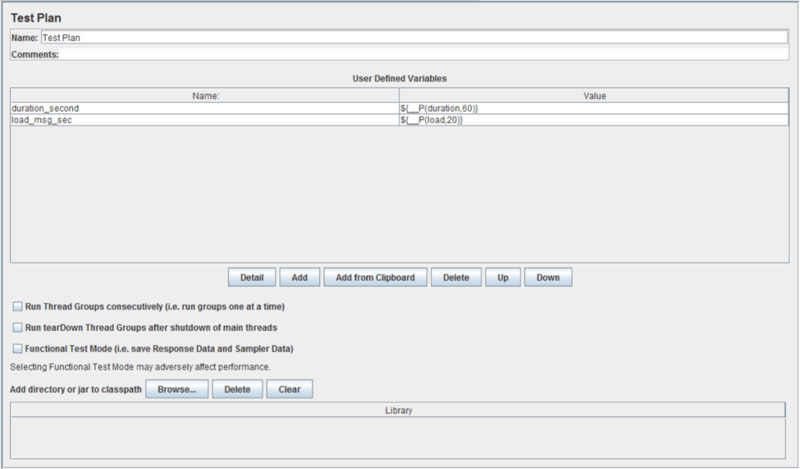 To obtain that conversion without losing readability we can use the JEXL expression available in the JMeter function. Take into account that the “__jexl2” function is used here. For the newer JMeter 3.x versions use “__jexl3”. For the purpose of this blog post, both functions are equivalent. To read a complete overview of JMeter functions, click here. Now, the RPS value can be defined at run time through the command line. This command line produces a non-gui execution of our script, for a duration of ten minutes and request per second of 50 msg/s. The execution is complete and the results can be analyzed (e.g. jtl file, graphs, etc…). After completing the execution, you can relaunch the jmx script with a new set of mapped variables and force the just executed test to a new RPS value. Take into account that every jmx script execution makes use of a RPS value, so to obtain RPS modification it is necessary to chain more jmx script executions. To automate jmx script execution, you can use Shell scripting. Now let’s suppose our specification requires us to run a script for a long time, but with different RPSs. In such a situation, it’s recommended to automate the run phase with a Shell script. A Shell script is a text file that contains a sequence of commands for an operating system. Here are two execution script templates, in Bash and PowerShell, for Unix-like and Windows operating systems. Both scripts describe how to run command line arguments, to obtain a specific RPS load in JMeter. In these examples, the JMX script is executed twice, first with 50 rps and then with 100 rps. echo "Execute stress script with load $rps msg/sec"
"Request per second : $rps"
$stdOutLog = "$BaseScriptPath\stdout_$ExecTimestamp" + "_" + "$rps.out"
Write-Error "XXXXX Exception occurs during JMeter : $_.Exception.Message"
That’s it! You now know how to adjust the RPS through the command line for a one time run, and via Shell script for an automated run. You can learn more JMeter for free through our JMeter academy. To check out BlazeMeter, which enhances JMeter, request a demo or just put your URL or JMX file in the box below, and your test will start in minutes.